From the Dark Universe to the MonsterVerse, the Marvel Cinematic Universe to Warner’s rejuvenated DC Extended Universe – you can thank Patty Jenkins’ Wonder Woman movie for delivering the studio’s first bona fide critical hit – you don’t have to search too far to locate one of Hollywood’s interconnected franchises. On the horror side of things, Warner Bros. has been making serious headway on its Conjuring universe in recent years, commissioning a full-blown sequel in The Enfield Poltergeist and multiple spinoffs. That expansion took the form of 2014’s Annabelle, John R. Leonetti’s horror prequel that scared up $256 million worldwide. An impressive feat, given it was tethered to a shoestring budget of just $6.5 million. 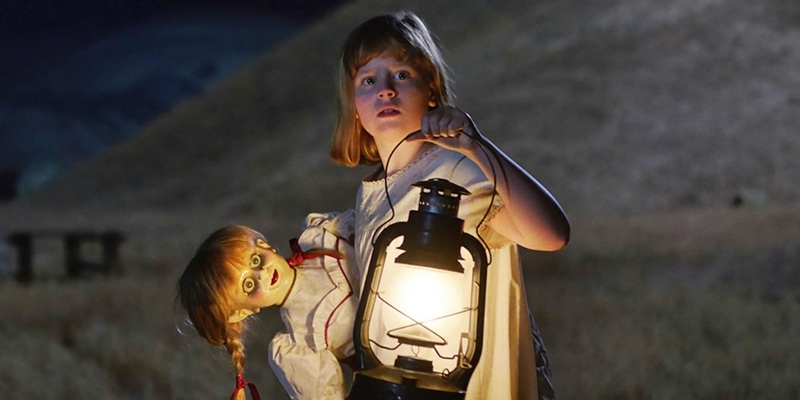 Hoping to catch lightning in the bottle once again is David F. Sandberg (Lights Out), who is at the helm of this year’s horror sequel, Annabelle: Creation. And so, following up on a handful of chilling pics (see below) and a suitably creepy poster, today brings forth the film’s all-new trailer, and it looks to be another exercise in nerve-shredding terror. Directing from a script penned by Gary Dauberman, who worked on the original sleeper hit, we know Sandberg will be presiding over a cast comprised of Stephanie Sigman (Spectre), Talitha Bateman (The 5th Wave), Lulu Wilson (Ouija 2), Philippa Anne Coulthard, Grace Fulton, Lou Lou Safran, Samara Lee, Tayler Buck, Anthony LaPaglia and Miranda Otto. Following up on two Conjuring films and an Annabelle spinoff – The Crooked Man is another offshoot incubating in development – Annabelle: Creation is expected to light up theaters on August 11th. Curious to go up close and personal with today’s all-new promo? The gallery below ought to do the trick, as it features sneak peeks at both Talitha Bateman and Lulu Wilson in action.